Polymer insulator (composite) is an electrical device consisting of insulation section made of polymer materials and metal fittings. Polymer Insulators are characterized by small size, light weight, high mechanical strength, no zero value detection, easy installation and less maintenance have become a new generation insulators for high voltage transmission lines. The second purpose is very important to operation since without some form of insulating material, electrical circuit cannot operate and any insulation deficiency oftentimes would result to trouble, say flashovers. 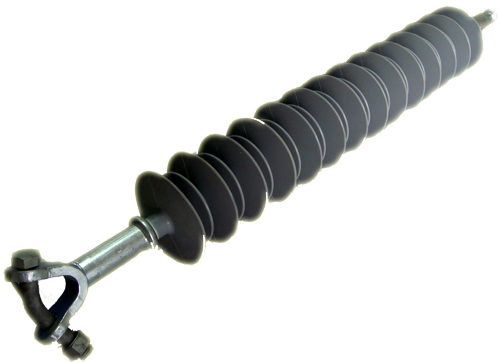 Polymer Insulators differs in the fact that the protective ribbed mold is made of silicon organic rubber. The insulation unit is still made of fiberglass as well as flanges are made of antitrust alloy thus providing safe long-term operation under various climatic conditions. 2. Insulation core unit – a rod made of composite dielectric substance – fiberglass, as a rule (tar reinforced with fiberglass) or consisting of separate elements assembled at the unit in a particular order. 3. Insulator fittings – flanges (end terminals) and screen fittings. Polymer insulators have been increasingly accepted by electric utilities as suitable replacements for porcelain and glass insulators since it was first introduced early 70s. Polymers that comprise the insulators are ethylene propylene polymers. The type of polymers that are used as insulators could either be EPR, EPDM, or Silicon Rubber. EPRs are among the best weathering resistant synthetic polymers. It has excellent electrical, chemical and mechanical properties with superior aging and color stability. In general all EPRs have outstanding resistance to heat, oxygen, ozone and sunlight. In fact, the resistance of EPDM rubber to sunlight is rated equal to that of silicone rubber. Silicone rubber but it are resistant to sunlight heat and are flexible over a wide range of temperatures. Silicone rubber is a hydrophobic material (repels water). But, unlike the EPR backbone, the silicon-oxygen bond is susceptible to attack by acids and bases. EPDM/Silicone Alloy is an alloy developed by some insulators manufacturers. They combined the best properties of these two materials and call the compound ESP. Polymer Insulator specifications are basically similar to that of porcelain. The two basic components of its specifications are the Mechanical and Electrical Characteristics. Also during specifications, it is important to specify the end fittings, or terminals, so that there will be consistencies in the lines hardware that you are going to use. More of Polymer Insulators and its comparison to porcelain on the succeeding post.